THURSDAY JANUARY 24 (Valhalla, NY) – Sophomore Miles Haughton (Mamaroneck, NY/Mamaroneck HS) scored 17 points and added five rebounds, and freshman Robert Pope (Bronx, NY/Lehman HS) scored 10 points and added five rebounds. The Westchester Community College Men’s Basketball team lost their second consecutive game, 105-73 to County College of Morris – the nation’s 16th ranked team – on Thursday night at Westchester Community College. With the loss, the Vikings are now 11-7 for the 2018-19 campaign. It was a tale of two halves on a rainy Thursday night as the two teams went toe-to-toe for the opening 20 minutes. Westchester led the game four times during the first half, and trailed by only a single point in the final minute of play before halftime, but a late CCM three-pointer gave the visitors a 36-32 lead at halftime. The first half stats were nearly a wash as CCM shot 40%, compared to Westchester’s 36%, the Titans out-rebounded the Vikings 24-20, and each team had 10 turnovers. However, the second half was a completely different story. A Fabian Johnson (New York, NY/Our Savior Lutheran) lay-up with 17:11 to play brought the Vikings to within three points, 45-42. However, a Westchester technical foul immediately after Johnson’s basket gave CCM new life, and from there, the Titans went on a 27-4 run over a seven-minute span to blow the game wide open. From there, CCM coasted to the win. The second half saw CCM shoot 67% from the floor – compared to Westchester’s 46%. In addition, the game seemed to turn on the turnover battle as CCM turned the ball over only twice over the final 20 minutes, while Westchester had 16 turnovers during that span. For the game, the Vikings out-rebound CCM 43-35. Johnson added eight points and five rebounds for WCC, Joe Zayer (West Nyack, NY/Clarkstown South HS added 7 points. SATURDAY JANUARY 26 (Valhalla, NY) – Not even 48 hours after their most devastating loss of the 2018-19 season, the Westchester Community College Men’s Basketball team found their rhythm at just the right moment on Saturday, and in doing so, may have found the key to get their season back on track. It was not easy, but if the final 10 minutes of the Vikings’ 77-56 win over Rowan College at Burlington County are a sign of things to come, the recent skid for WCC is over, and there are many big games coming up. Four Vikings scored in double-figures, and sophomore Miles Haughton (Mamaroneck, NY/Mamaroneck HS) enjoyed an incredible all-around game as Westchester opened up a big lead early, just to almost lose it, and then play 10 of their best minutes of the year to break things open en route to their 12th win. Haughton led all scorers with 23 points. He added seven rebounds, four assists, four steals, and two blocked shots. In addition, he made a single play to change the Vikings fortunes, and literally steal the win. After Westchester took a 16-point lead late in the first half, and led by 14 points at halftime, the Vikings held a 52-36 lead with 14:13 remaining in the game. From there, RCBC (13-9) made the most improbable of runs, outscoring WCC 15-0 over a 3:30 span to make it a 52-51 game with 10:46 to play. After a Viking turnover, RCBC called a time-out to set up what would have been a go-ahead play. Enter Haughton. The speedy sophomore fought through a screen and intercepted a Baron pass, sprinting the length of the floor for a lay-up and a 54-51 lead with 9:51 to play. From there, Westchester went on a 16-2 run to take a 68-53 lead with 6:45 to play … and the rout was on. Overall, Westchester scored 25 of the game’s final 29 points during the final 9:51. Sophomore Monte Lambert (Brooklyn, NY/James Madison HS) had 14 points and four rebounds, sophomore Joe Zayer (West Nyack, NY/Clarkstown South HS) added 11 points, six assists, and four steals, and freshman Fabian Johnson (Suffern, NY/Suffern HS) enjoyed a terrific game with 10 points and five rebounds. 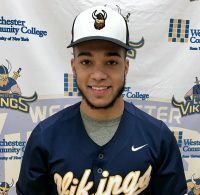 The Vikings also received another rugged effort from freshman Robert Pope (Bronx, NY/Lehman HS) who grabbed a game-high 14 rebounds, and added two blocked shots. Overall, the Vikings shot 42%, compared to RCBC’s 31%, and out-rebounded the Barons 48-40. SATURDAY JANUARY 26 AND SUNDAY JANUARY 27 Sophomore Matthew Rice (Lagrangeville, NY/Arlington HS) and freshman Edward Aiken (Middletown, NY/Pine Bush HS) continued their outstanding start to the 2019 season. Freshman Brianna Kara (Shrub Oak, NY/Lakeland HS) enjoyed a fine debut as the Westchester Community College Men’s and Women’s Bowling team’s competed twice last weekend, and featured strong outings both times. The Viking men placed eighth at the Westchester Shootout on Saturday at Fishkill Bowl in Fishkill, NY before placing seventh in the Westchester Classic on Sunday at Spins Carmel Bowl in Carmel, New York. On Saturday, Aiken turned in the best individual performance from any bowler during the day, firing a 255 during the third singles game. He finished in 23rd place overall among individual bowlers, averaging 185.8, a mere 69 pins away from a top-10 finish. Rice finished in 13th place with a 193.3 finish, twice breaking 200 pins. His 241 during the second game was the fourth-best individual effort of the entire day, and he was only 19 pins away from a top-10 finish. Additionally, the doubles team of Rice and Aiken shot an 1176 to finish in third place overall. Also for Westchester, freshman Matthew Rush (Valhalla, NY/Valhalla HS) finished the day with a 185 average, including a 214 during the second game. Kara, competing for the first time this season, averaged a 116.3 for the day, hitting a 120 during the last two games. Sunday’s competition saw the doubles team of Rice and Aiken improve to an 1185. Brianna Kara threw a 548 series to finish 10th in Women’s singles. She had a high game of 214. Freshman Jada Tom (Elmsford, NY/Alexander Hamilton HS) scored 11 points and added three rebounds and four steals, and sophomore Paige Collins (Jamaica, NY/Wadleigh HS) added eight points, 10 rebounds, and three blocked shots, but the Westchester Community College Women’s Basketball team fell to Suffolk Community College, 69-42 on Tuesday night at Suffolk. With the loss, the Vikings are now 1-2 for the 2018-19 season. Westchester hung tough during the opening half against the 10-3 Sharks, battling throughout the opening 20 minutes, and trailing 37-24 at halftime. However, Suffolk opened the second half on an 18-2 run, and never looked back. Shanaya Jones (Bronx, NY/Health Opportunities HS) added nine rebounds, five assists, and two steals.